This is my third in the series of Christian coloring cards by this publisher. 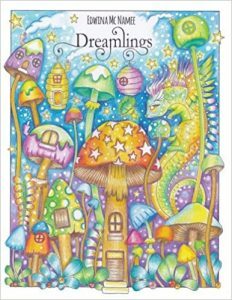 The 44 cards are inspired by the coloring pages in their previous coloring book “A Garland of Grace”. While the cards are similar to the book, the designs have been reduced, cropped, and/or slightly reworked to fit the new format of a smaller card. All of the cards have quotes and cites to the Proverbs. 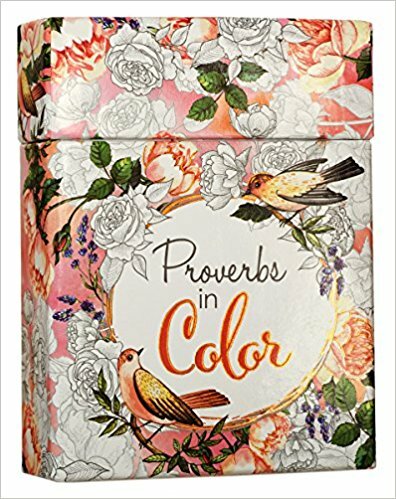 For me, the Proverbs are one of the first books in the Bible I search out when I am trying to learn how I should be living my life. There are life lessons to be learned from each quote and sometimes I find them easy and sometimes I find it more difficult even though I know they are right. While I cannot find translation information on the cards, the coloring book from which they are derived listed the following Bible translations used for the verses are: Holy Bible, New International Version NIV, Holy Bible, New Living Translation, Holy Bible, Contemporary English Version, and Holy Bible, English Standard Version. The cards are 3 1/8 x 4 1/8 inches. Eight of the cards are in horizontal format and the rest are vertical. The color is very light ivory (almost a warm white), the texture is slightly smooth on the design side and extremely smooth (probably with a coating) on the reverse blank side. They are a great size for on the go. 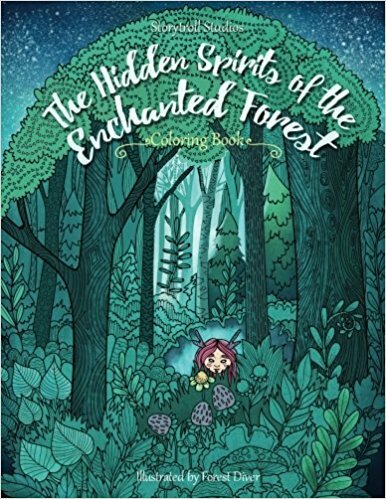 This is a re-print of a coloring book originally published by Okami books. Okami seems to have morphed into Storytroll Studios publishing under the name Julia Rivers. The artist of this book is Forest Diver. I had not purchased the original book, so this is the only copy I have. I mention it so you don’t buy a second book by mistake. 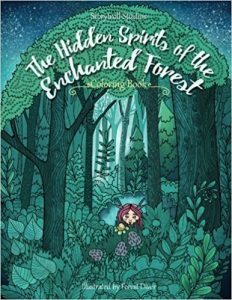 The book is filled with 40 unique and highly detailed designs based on lovely woodland fantasy creatures. The designs simply flow on the page. I’m hard put to find a straight line among them. The creatures stand next to or seem to become part of the landscape around them. Mr. Diver is a new artist for me but I am really taken with his style. I’ve bought the second book in this series as well as another one which he created. The designs are detailed and, in some cases, have more intricate areas to color. I plan to use highly sharped colored pencils on those areas rather than to find a special nib pen et al. 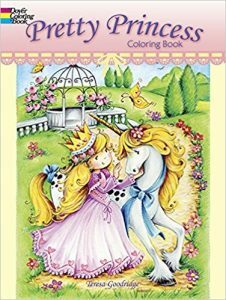 I own one or two other coloring books by Edwina McNamee. Her designs are generally cute and have an overarching theme, though she does have some coloring books which are in the “sweary” theme. As a matter of personal preference, I don’t buy or color that style. In this case of this book, she has created a land of cute little animals and creatures called Dreamlings. You will find both “real” style animals as well as mythical ones. They seems to live in this wonderful forest which has trees and plants and flowers and lots and lots of mushrooms. I am much taken with a design of fairies which have mushroom caps on their heads! I was so taken with this book, I have now bought the second in the series as well. The designs are detailed but not overly so. They will make for a nice time spent coloring. The designs are not intricate nor difficult to color and do not need speciality pens, pencils in order to do so. The designs are printed twice – once with black lines on white paper and the second time as white designs printed on black paper. The change in the paper tone gives each design a very different look which I personally appreciate. 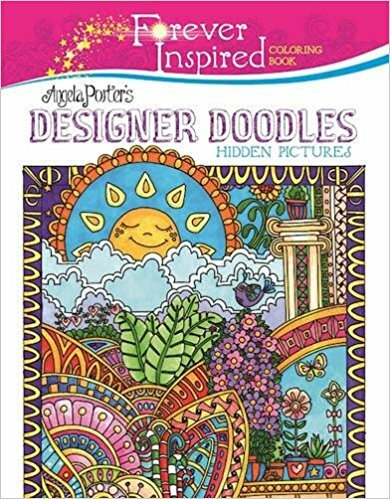 This is a coloring book filled with 35 designs in Angela Porter’s imaginative style. It reminds me a great deal of her “Entangled Landscapes” but with much less intricate designs. The designs range from landscapes and seascapes to flowers to simply fun patterns. This series of books is being marketed to tweens but I think Ms. Porter’s books in this line are equally good for adults. I like them not only for myself but also for anyone who might have been unable (or unwilling) to attempt her much more intricate designs. The designs are still fairly detailed but are larger and easier to color. Notwithstanding that, they are instantly recognizable as Ms. Porter’s style. 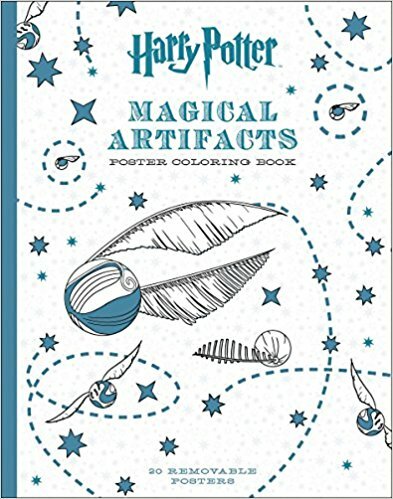 An extra fun part of coloring the designs in this book are the hidden pictures (really more elements) that you can look for on the various pages. There are eight different style of elements in this book, which are: ladybugs, hearts, cat heads, stars, candies, buttons, music notes and raindrops.) Some are larger and some are smaller. What especially like is that they are not as obtrusive as I have found with a few other hidden picture designs. At the time I am writing this review, the product description is for that of the Tropical Rainforest rather than for this book. It also mentions 44 designs. There are only 35 so hopefully the publisher will get these errors fixed in the future. I’m a real fan of Hallmark movies both mysteries and romance. They are always clean and wholesome stories with a happy ending. Perhaps not as life-like as reality but certainly what we all hope and long for. 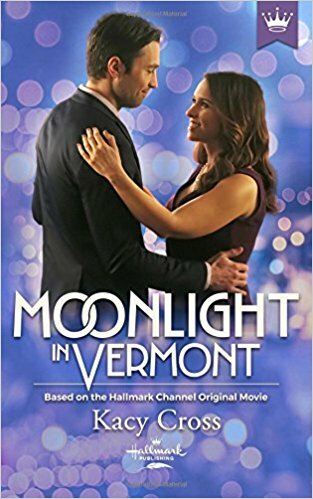 Hallmark has recently been releasing books which are based on their movies. “Moonlight in Vermont” is just such a book. I definitely enjoyed the movie, which starred Lacey Chabert who is a favorite of mine. Because of seeing the movie, I continue to see the character of Fiona (in the book) in the guise of Lacey. The book reads like the movie but with a deeper feeling as, in the book, we are privy to the thoughts and feelings of the characters. This is something, in a movie, that an actor has to relate by expression or tone of voice and that is something I can miss seeing/hearing as a viewer. In a book, I can mull over the thoughts to see the why of what happens and not just the consequences of the action. 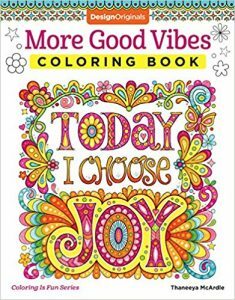 This is another fun coloring book Thaneeya McArdle. I own several of her books have always have a fun time with them. 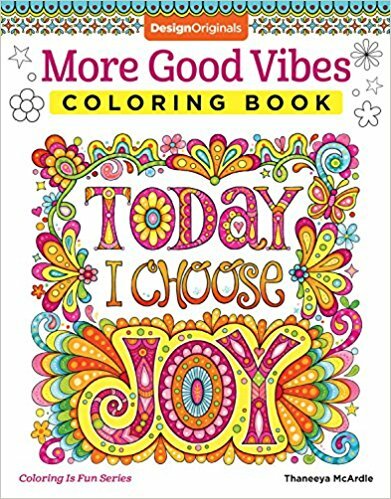 This is a second book of feel good and inspiring messages “good vibes”. I don’t own the first in this series but am having a great time coloring in this book. There are cute designs with sayings and the back of the page has quotes by famous individuals and unknowns which range from inspiring to funny. I noted that the back of the page is now back in gray rather than colors. I prefer that as sometimes the color could show through to the front of the page depending on which medium I work with. I own a few coloring books by Teresa Goodridge but they are all seasonal scenes set to appeal to a more adult group. 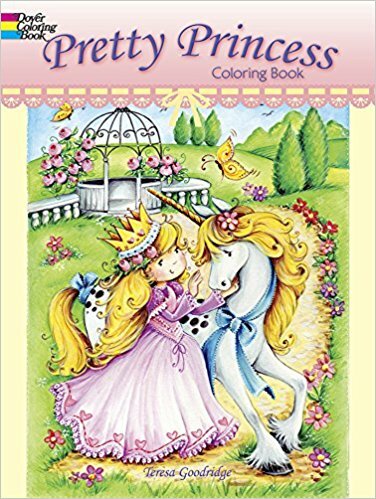 With Pretty Princess, her artwork takes another turn and is filled with cute and delightful images of a young princess. She is shown in many different settings with lots of flowers and sweet expressions. While the images may appeal to both younger and more mature individuals, the designs have a level of detail which may prove a little difficult for a very young audience. I personally like these youthful images though I admit that I bought this book originally thinking it would be one that I would eventually color with my granddaughter. Turns out that I want to color in it during the meantime. 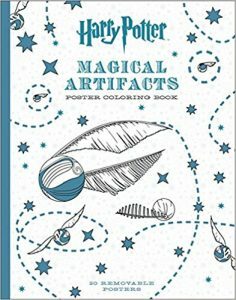 I wish that Dover had released this coloring book in either their Creative Haven or Sparks lines as those are printed one side of the page. The only drawback I have with this book is that it is printed two-sided. As I knew that going in, I will not subtract a star in my rating but wanted you to be aware of it if that is a deal breaker for you. This is a fun new series for me. It is the cozy mystery genre that I enjoy. In this series, Tallulah Jones is a fairly new divorcee. As part of her divorce settlement, she has purchased an older house in town (complete with many necessary rehab projects) as well as starting a new handmade ice scream shop. 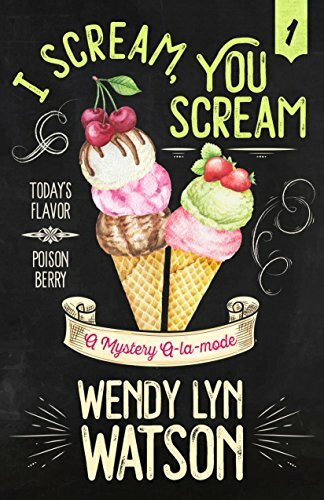 I must admit, though I am severely lactose intolerant and ice scream a no-no, the flavors of ice referenced in the book had my mouth watering. I wish the author had included recipes as well. The story starts as Tally is hired to do the desserts at her ex-husband’s annual all-holds barred company picnic. Tally is getting over the oddness of being hired by her ex but needs the money to keep house and home together. Seeing her ex with his new squeeze Brittney (just about young enough to be her daughter) is not too unsettling, that is, until the next day, when Brittney turns up dead. 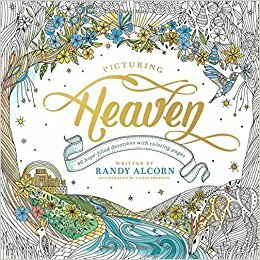 This is a lovely Scripture-based coloring book with Devotionals by Randy Alcorn and illustrations by Lizzie Preston. The subject of the book is Heaven. What will Heaven look like and be like according to the Scriptures? The Scriptures and devotionals are on the left side of the open pages and the design for coloring is on the right side. The Bible translations used in the book are listed in the front and are fairly extensive. I found that most of the designs were representations of the study on the facing page. Perhaps all of them are and a few were too subtle for me to grasp. In any case, I enjoy Ms. Preston’s work and will enjoy coloring this book. The revelation to me are the devotionals by Mr. Alcorn. I had not read his books but will certainly pick them up. He has a wonderful way of keeping right to the heart of the subject both quickly and eloquently. Each study looks at and discusses a single subject regarding Heaven. Some subjects include: Eternal Freedom from Sorrow, At Last, We’ll Have Time for Everything, Will We Reunite with Our Favorite Pets?, Our Greatest Joy Made Greater, No More Pain, Tears, or Death and much more. I plan to make each devotional a Bible Study lesson for myself. As there are 40 in the book, at the rate of one per week, the book will last close to a year. The only one nit that I have with the book is the pre-printed flat gold tone on each of the designs. No matter what coloring medium I use, I will not be able to match the color or the texture of the printed color. I will probably use whatever medium I choose for the rest of the design and go over the pre-printed color to make it my own. However, it would have been much better to not have it to deal with.